Growing from an egg into an insatiable larva to be transformed into a lovely flying flower is a process that captures my imagination. 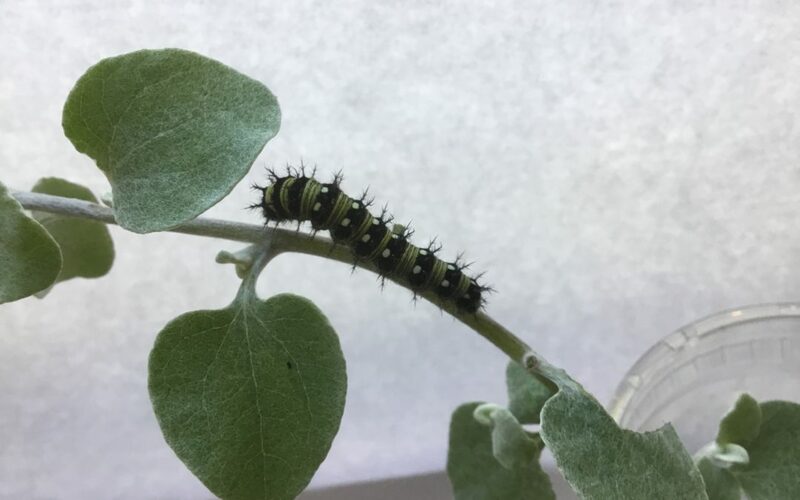 Earlier this year, when I found a scary looking caterpillar eating my licorice plant, I killed it. I wanted a colorful bug free garden with perfectly shaped leaves. The next day, I found a second caterpillar eating another licorice plant. I realized it must be a special caterpillar for the butterfly to lay only one egg on each plant. I took photos to my local garden store hoping they could help me to identify the caterpillar. We decided it was a painted lady butterfly. The store owner was kind enough to give me a new licorice plant for the caterpillar to eat. I planted it in the back yard and placed the caterpillar on it. I was thankful for her commitment to preserving the pollinators. Throughout the summer, I kept finding more caterpillars and moving them to the new licorice plant in the back yard. My husband decided to “go green” and not use pesticides in our yard. 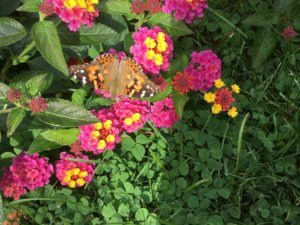 Our reward, one afternoon in October, my husband walked by the brilliantly flowering lantana plant and the sky filled with at least twenty butterflies. Over the next two weeks, we had countless painted lady butterflies in our flower gardens collecting nectar for their long migration to Mexico. The transformative life cycle of butterflies is not only inspirational but also instructional. As I prepare to end the fall semester this month, I enjoy looking at the “butterflies” in my classroom. My students began as hungry larvae consuming information and working to understand new ideas. As they struggled with questioning and developing their own understanding of science, they grew stronger and more independent. In our last weeks together, they are flapping their wings and preparing to leave a nurturing classroom. My students face many challenges ahead, but they have learned to persevere and to trust their wings as they are transformed by the renewing of their minds. I hope that, through our work together, they better recognize their gifts as they develop into who they will become. how they are overwhelmed by all that is expected of them. Their growth through learning new ideas and using them to sharpen their own ideas encourages my students as they strengthen their wings. They are prepared for the migration to their next destination, whether it is in the classroom next door or the university down the street. I look forward to receiving my next batch of larvae later this month. I am grateful as I look out on all of the beautiful butterflies who have passed through my classroom doors.